Zurbaran began as apprentice painter in Seville, where he met the Pacheco and become a friend of Velasquez. In the early years of his career, Zurbaran lived in Llerena and in 1626 he received the first important commission in Seville: the cycle of San Pablo El Real. In 1629 he settled in Seville, where he worked for the cathedral and various religious orders (Franciscans, Dominicans, Carthusians). In 1634 he was invited by Velasquez to participate in the decoration of the Salon de Reinos del Buen Retiro with a series of paintings on the myth of Hercules. Returning to Seville, Zurbaran executed the most important works of his career: the paintings of the monastery of Jerez and the sacristy of the Church of the Gerolomini of Guadalupe. From 1640 he received numerous commissions for churches in the Spanish Americas. Zurbaran, until his death in precarious economic conditions, was painter of the soul, interpreting a Franciscan spirituality of devotion and humble naturalism. The handling of light in Zurbaran's paintings creates the depiction of profound mysticism. Zurbaran today. New documents, new works. 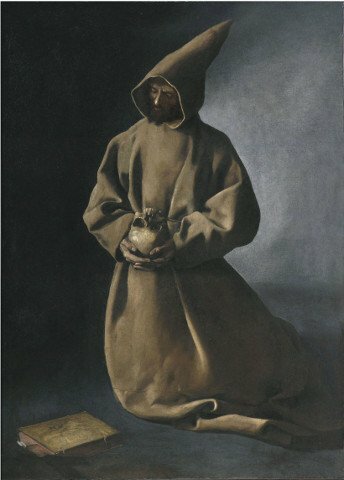 The poor man of Assisi, wearing a simple habit without a cape and with a very pointed hood seems deeply absorbed in meditation on the "ultimate end of man" evoked through the skull which he contemplates, probably without seeing it, totally absorbed within an inner vision. The bottom left almost black becomes lighter on the floor, especially the right side which violently illuminated. This brutal lighting, typical of the works of his youth, create deep shadows which are very pronounced on the surface of the robes with shades of beiges ranging from almost ivory on the splits of the pleats to a very dark brown in backlight parts. The same shades are apparent on the light leather-bound volume at the feet of the saint. The magnificent face disappears behind the hood and announces the shocking face of St. Francis in Ecstasy of the National Gallery in London, with a strong side light that illuminates of a white touch the tip of the nose. Rediscovered in England, the present painting could have belonged to the Spanish collection of Louis Philippe. A work with the same subject and slightly smaller size, still unknown, could correspond to this picture. The work is certainly contemporary to the Saint Francis, signed and dated 1632, in the Shaw collection in Buenos Aires. (Translation of a Dr. Od1le Delenda's written, published on "Archivo Hispalense", special issue for Zurbaran IV centennial birth anniversary). The present painting will be included in the forthcoming monograph of the artist by Dr. Delenda to be published by the Wildenstein Institute.